So here's the thing. I have other interests other than pastoring and sermonizing although those things usually take up most of my blog. I thought that for 2013 I would provide you fine folks with some other forms of light reading and do my best to comment on cultural phenomena, literary thingies, artistic stuff and perhaps a movie or music review now and again. 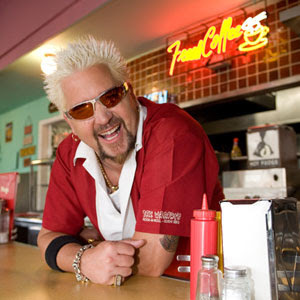 I've watched about two hundred and twelve episodes of the Food Network's perennially awesome show Diners, Drive Ins & Dives hosted by the perennially tattooed and spiky haired chef Guy Fieri (left). It is, without a doubt, my favorite show that doesn't have zombies, football, car chases or explosions. Come to think of it, if there was one show that had all of those things---I would probably never leave my man cave. If you go to Ted Peters you definitely have to try the smoked mullet which is smoked for four to six hours over native Florida red oak. The smoked fish is served dramatically with the head and tail attached, but once you start to dig in, you quickly forget all of that--if it was a problem at all. Additionally, the smoked fish dip is completely "on point," to coin a Guy-phrase. You can easily fill up on club crackers and fish dip long before your entree arrives. If fish isn't your bag, you can get the Jumbo Hamburger or Cheeseburger, which is surprisingly good. 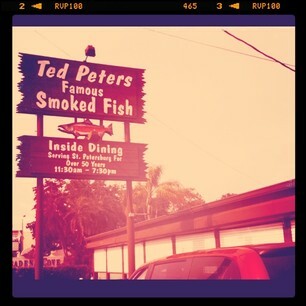 I enjoyed Ted Peters, and the atmosphere is pure Old Florida. I would give it three out of four stars. The Tampa Bay Brewing Company is located in historic Ybor City in Tampa. Ybor City is the old Latin quarter of Tampa, where generations of immigrants from Cuba, Spain and Italy first settled in the 1880s. The area was essentially the center of the cigar making industry in the U.S. until the Great Depression. Ybor City has been revitalized over the past several years, particularly around 7th Ave which is where the Tampa Bay Brewing Company is located. TBB's on-site brewery is equipped to produce up to 12 tap beers, and several cask-conditioned ales. I would suggest ordering a sampler of the micro-brews to really get a taste for what they offer--the portions are pretty generous! For a meal I would recommend the Barleywine Meatloaf (pictured above) a pork, beef mixture wrapped in bacon and cooked with one of the micro-brews then served on top of cheddar mashed potatoes and topped with onion strings. OR you can try "The Bomb" a 1/2 hamburger topped with bacon and onion strings and wrapped in pizza dough which is backed to a finish in the TBB's pizza oven. Dang son. I give Tampa Bay Brewing Company four out of five stars. 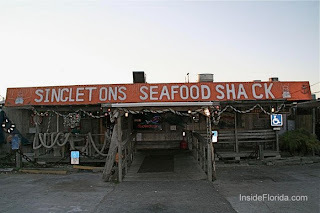 When you pull up outside of Singelton's Seafood Shack, you completely understand why the "Shack" is placed in the name. It looks like a dive, to be sure. But this Triple D entry definitely has some awesome seafood within, particularly the fried shrimp. I recall the smoked fish dip was outstanding, as well as the fried shrimp. The hush puppies had a very homemade taste and were cooked perfectly--nice and crispy on the outside and nice and moist but not too mealy on the inside. It was also a very kid friendly environment right on the water, but it did have one disadvantage---if you eat outside, you will definitely catch a pungent whiff of the waterway. But that sort of adds to the atmosphere of the place, to be honest. I give Singleton's three out of four stars. The Metro Diner is a neighborhood fixture on Hendricks Avenue, just blocks away from downtown. One of the current owners was a former vice president for Cracker Barrel, and while there is a hint in the Metro of the same sort of "comfort food" you find at those ubiquitous restaurants, it's at a whole other level. 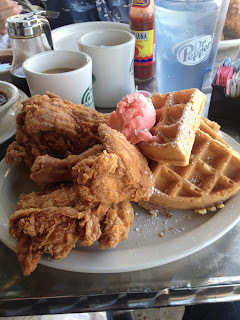 I would highly recommend the Chicken and Waffles, which you see to the right. The portion is amazing. You will get a full half chicken fried to perfection and a whole waffle that is also perfectly cooked. The batter used for the waffles is almost like cake batter---with a hint of sweetness, and a taste like heaven. The waffles are topped with a light and fluffy strawberry butter. The waiter or waitress will mix for you a concoction of maple syrup and tabasco sauce right at your table---I highly suggest you dip your chicken in it and dig in. 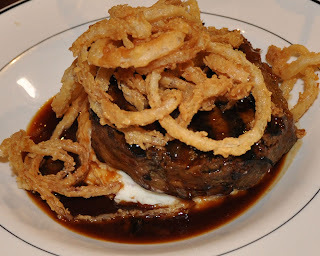 Some of our party tried the meatloaf, which was outstanding and we also had some folks try the Eggs Benedict, which I tasted and which were cooked to perfection. I've returned to the Metro since my first visit, and will definitely return again. I give The Metro five out of five stars.